Sacred Heart's Edward Williams skimmed the hurdles in a time close to his season's best to finish far ahead in 7.43. Last year's champ Deshaune Poole was 2nd in 7.72, Aidan McShane of Masuk got 3rd in 7.78, and final three scoring spots went to Enrique Garcia Lopez of Windham, Myles Hall of St. Joseph, and Jonathan Lindsay of New Britain. Christopher Pigatt of Hamden was the fastest guy in the preliminary heats, and he captured the title of the fastest guy in the CIAC after a long review in the closest boys race of day. Pigatt edged Korey Morton of Brien McMahon by .002 seconds with both getting 6.51 marks. Michael Rodia of Shelton and Jaylon Nealy of Bloomfield were 3rd and 4th at 6.53 and 6.56, and Conor Mahoney of Masuk and Kymali Hay of Bloomfield were 5th and 6th. Meet Record: 34.10 This Year's Winner: Deshaune Poole (Hillhouse) 35.11. Last year Deshaune Poole of Hillhouse was the 55m hurdles champ, but this year after taking the silver there he got gold in the 300m as he edged Ja'kwan Hale of Derby by 35.11 to 35.19. 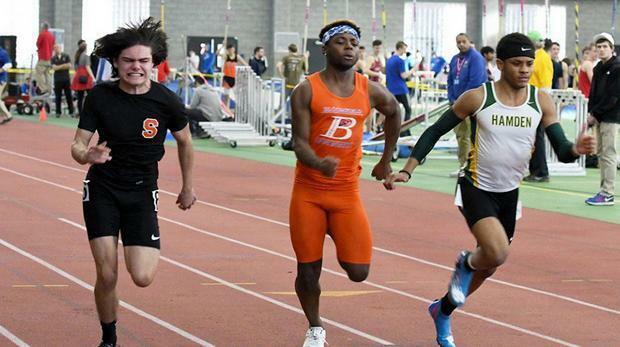 Lyman Hall's Michael Toppin took 3rd at 35.63 and Kymali Hay of Bloomfield was 4th at 35.72. Baruch Goodman of Weston got 5th out of the lower-seeded 2nd section, and Tyler Cady of Fitch was 6th. Reigning champ Malcolm Going of Danbury took the lead from the start and ran off to another crown with a 1:21.40 time. Jared Sharp of Suffield was 2nd at 1:22.86, Simon Jupp of Ridgefield was next at 1:23.38, and Jose Ramirez of Bristol Central was 4th at 1:24.13. Elijah Lewis of Crosby and Cory Bill of EO Smith captured the 5th and 6th places out of the lower seeded 2nd section.